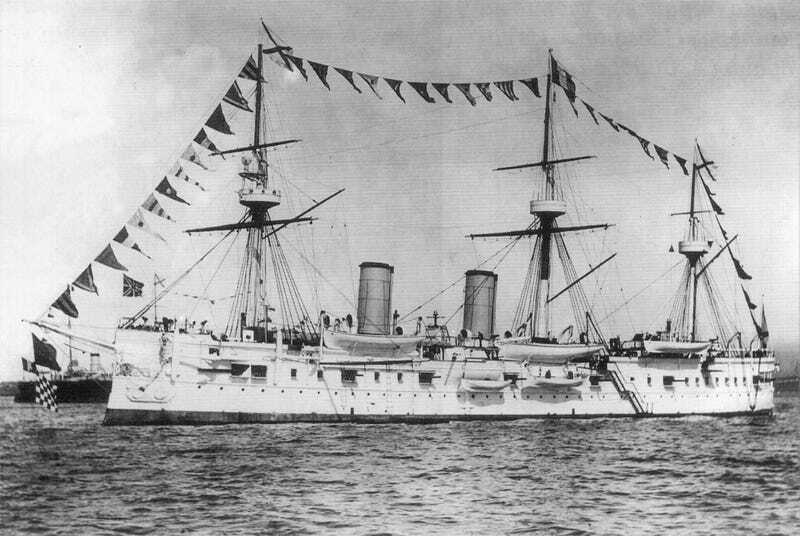 The Imperial Russian Cruiser Dmitriy Donskoi. A missing Russian Imperial Navy cruiser said to contain 200 tons of gold bullion worth an estimated $133 billion has been discovered after being lost at sea for 113 years. The wreck of the Dmitrii Donskoi, a 6,200-ton warship that went down during the Russo-Japanese war of 1904-05, was discovered on July 15 about 0.8 miles (1.3 km) from the shores of Ulleungdo, a South Korean island located 75 miles (120 km) east of the Korean Peninsula, the Telegraph reports. The ship was found under 1,400 feet of water (430 meters) by an international consortium led by a South Korean salvage team called the Shinil Group. Launched on March 28, 1881, the Dmitrii Donskoi was the first Russian armored cruiser. It was designed to attack merchant ships, and was capable of raising a full set of sails to conserve coal consumption. On May 29, 1905, the ship was deliberately sunk by its captain, Ivan Lebedev, after taking serious damage during the Battle of Tsushima. The crew had been ordered ashore at Ulleungdo the day before. The ship is rumored to contain 5,500 boxes of gold bullion amounting to 150 trillion won, or $133 billion, according to the Telegraph. Using a pair of robotic subs, the Shinil Group captured footage of the sunken ship, revealing extensive damage caused during its encounter with Japanese warships, along with cannons, deck guns, the anchor, and the ship’s navigation wheel. The images also showed what appeared to be cyrillic letters on the ship, indicating its Russian origin. The joint salvage team, which also involves experts from China, Canada, and the UK, says it plans to collect as much treasure from the ship as possible, and give half to the Russian government. The group says it’ll donate 10 percent to the South Korean government for the purpose of transforming Ulleungdo island into a tourist destination. These plans are all fine and well, except that the Shinil Group hasn’t yet applied for salvage rights with South Korea’s Ministry of Maritime Affairs and Fisheries. It’s not clear if approval will be granted, or if the Shinil Group’s terms, as its outlined them, will be honored. South Korean law requires salvage companies to deposit 10 percent of the estimated value of a shipwreck prior to starting its salvage works, according to the Korea Herald. If that’s the case, and given the estimates of how much gold is still on board, the Shinil Group would have to pay a 15 trillion won, or $13.2 billion, deposit before it can get to work. Naturally, the Shinil Group disagrees with this assessment, saying it found a ship, and not a treasure, so the value is closer to 1.2 billion won ($1 million), leading to a more modest deposit of 120 million won, or about $105,540. The salvage group says it’ll be making a formal salvage claim later this week. This may be a lot of fuss about nothing. Russian experts say it’s highly unlikely that so much gold would’ve been placed into one basket, arguing that it would have been safer, and much wiser, to move such huge amounts of gold by train, the Telegraph reports. What’s more, the Dmitrii Donskoi, which was packed with 12 artillery guns, 1,600 tons of coal, and hundreds of sailors, couldn’t possibly have had enough room for the rumored number of boxes of gold. Even if the ship contains the gold, it’s not immediately obvious that the Shinil Group will be able to stake its claim. The governments of Russia and Japan will likely have strong opinions about the true owner of this alleged treasure. Correction: An earlier version of this post incorrectly stated the value of the gold at $133 million. It’s actually $133 billion.